RAPAPORT... Lucapa Diamond Company has recovered an 89-carat yellow rough diamond from its Mothae mine in Lesotho, it said Friday. The miner found the stone during bulk sampling in the asset’s southeast zone. The diamond is not part of the miner’s original forecast for the Mothae resource, it said. 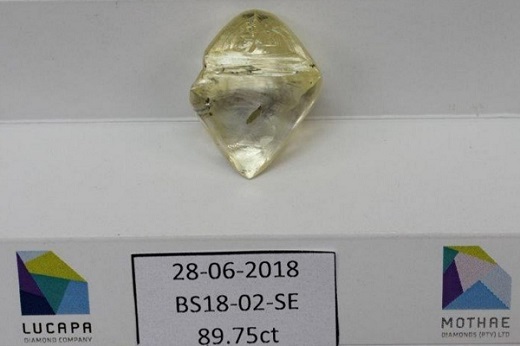 “Having recently recovered a 25-carat yellow diamond from the previously untested neck zone in our bulk-sampling program, we are tremendously encouraged that this 89-carat diamond was recovered from the southeast zone, an area of the Mothae kimberlite pipe where there has been very limited historical testing,” said Stephen Wetherall, Lucapa’s managing director. Lucapa bought 70% of Mothae in 2017, with the Lesotho government holding the remaining shares.